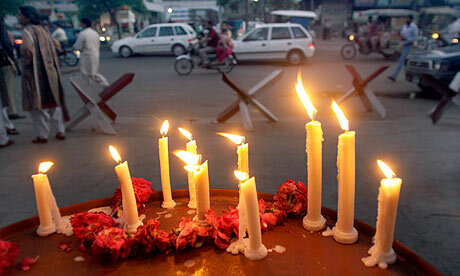 Chagatai Khan: Vigilante Trial by Fire in Pakistan & Blasphemy Law. 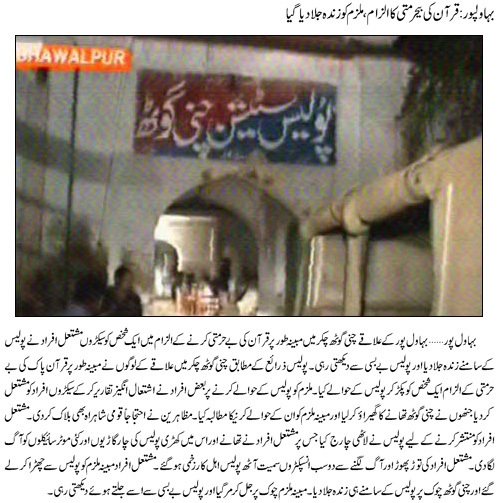 Vigilante Trial by Fire in Pakistan & Blasphemy Law. Administering Justice and awarding punishment is the responsibility of the Ruler/State [even in the harshest Islamic State] not of the Masses or Mullahs. A detail view is as under for kind perusal. I guarantee you that those who have done the above deed would also have been the most ignorant about Islam, Quran and Shariah. Read the "Shahadat - Testimony of Late. Mr. Salman Taseer for proving that he was a Muslim" and do read News filed by the Ansar Abbasi of Jang Group, and Program Telecast against Mr. Salman Taseer on GEO TV to prove that he was not Muslim for inciting hate against him and read these Hadiths in the light of Salman Taseer's Testimony published by the very Jang Group after inciting masses for his murder. If the above Hadiths do not satisfy then read this! A caller exposes Zaid Hamid's Blasphemy on Live TV. 1. (S/NF) Summary: During recent trips to southern Punjab, Principal Officer was repeatedly told that a sophisticated jihadi recruitment network had been developed in the Multan, Bahawalpur, and Dera Ghazi Khan Divisions. The network reportedly exploited worsening poverty in these areas of the province to recruit children into the divisions’ growing Deobandi and Ahl-eHadith madrassa network from which they were indoctrinated into jihadi philosophy, deployed to regional training/indoctrination centers, and ultimately sent to terrorist training camps in the Federally Administered Tribal Areas (FATA). 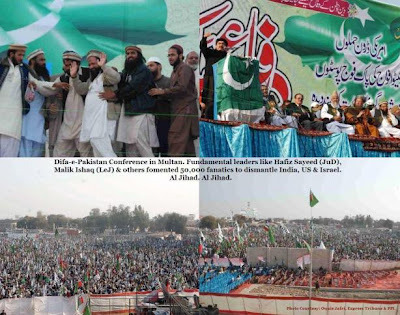 Locals believed that charitable activities being carried out by Deobandi and Ahl-e-Hadith organizations, including Jamaat-ud-Dawa, the Al-Khidmat Foundation, and Jaish-e-Mohammad were further strengthening reliance on extremist groups and minimizing the importance of traditionally moderate Sufi religious leaders in these communities. 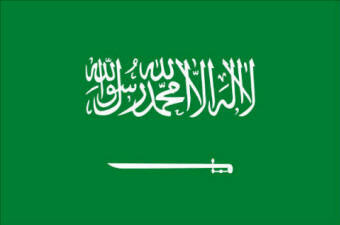 Government and non-governmental sources claimed that financial support estimated at nearly 100 million USD annually was making its way to Deobandi and Ahl-e-Hadith clerics in the region from “”missionary”" and “”Islamic charitable”" organizations in Saudi Arabia and the United Arab Emirates ostensibly with the direct support of those governments. Locals repeatedly requested USG support for socio-economic development and the promotion of moderate religious leaders in the region as a direct counter to the growing extremist threat. End Summary. 2. (S/NF) During a recent visit to the southern Punjabi cities of Multan and Bahawalpur, Principal Officer’s discussions with religious, political, and civil society leaders were dominated by discussions of the perceived growing extremist threat in Seraiki and Baloch areas in southern and western Punjab. Interlocutors repeatedly stressed that recruitment activities by extremist religious organizations, particularly among young men between the ages of 8 and 15, had increased dramatically over the last year. 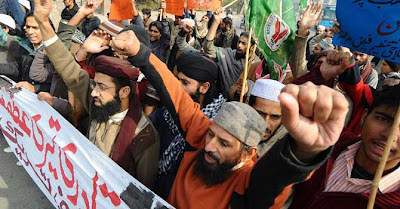 Locals blamed the trend on a strengthening network of Deobandi and Ahl-e-Hadith mosques and madrassas, which they claimed had grown exponentially since late 2005. Such growth was repeatedly attributed to an influx of “”Islamic charity”" that originally reached Pakistani pseudo-religious organizations, such as Jamaat-ud-Dawa and the Al-Khidmat foundation, as relief for earthquake victims in Kashmir and the North West Frontier Province. Locals believe that a portion of these funds was siphoned to Deobandi and Ahl-e-Hadith clerics in southern and western Punjab in order to expand these sects’ presence in a traditionally hostile, but potentially fruitful, recruiting ground. The initial success of establishing madrassas and mosques in these areas led to subsequent annual “”donations”" to these same clerics, originating in Saudi Arabia and the United Arab Emirates. The value of such donations was uncertain, although most interlocutors believed that it was in the region of $100 million annually. 3. (S/NF) According to local interlocutors, current recruitment activities generally exploit families with multiple children, particularly those facing severe financial difficulties in light of inflation, poor crop yields, and growing unemployment in both urban and rural areas in the southern and western Punjab. Oftentimes, these families are identified and initially approached/assisted by ostensibly “”charitable”" organizations including Jamaat-ud-Dawa (a front for designated foreign terrorist organization Lashkar-e-Tayyaba), the Al-Khidmat Foundation (linked to religious political party Jamaat-e-Islami), or Jaish-e-Mohammad (a charitable front for the designated foreign terrorist organization of the same name). 4. (S/NF) The local Deobandi or Ahl-e-Hadith maulana will generally be introduced to the family through these organizations. He will work to convince the parents that their poverty is a direct result of their family’s deviation from “”the true path of Islam”" through “”idolatrous”" worship at local Sufi shrines and/or with local Sufi Peers. The maulana suggests that the quickest way to return to “”favor”" would be to devote the lives of one or two of their sons to Islam. The maulana will offer to educate these children at his madrassa and to find them employment in the service of Islam. The concept of “”martyrdom”" is often discussed and the family is promised that if their sons are “”martyred”" both the sons and the family will attain “”salvation”" and the family will obtain God’s favor in this life, as well. An immediate cash payment is finally made to the parents to compensate the family for its “”sacrifice”" to Islam. Local sources claim that the current average rate is approximately Rps. 500,000 (approximately USD 6500) per son. A small number of Ahl-e-Hadith clerics in Dera Ghazi Khan district are reportedly recruiting daughters as well. 5. (S/NF) The path following recruitment depends upon the age of the child involved. Younger children (between 8 and 12) seem to be favored. These children are sent to a comparatively small, extremist Deobandi or Ahl-e-Hadith madrassa in southern or western Punjab generally several hours from their family home. Locals were uncertain as to the exact number of madrassas used for this initial indoctrination purpose, although they believed that with the recent expansion, they could number up to 200. These madrassas are generally in isolated areas and are kept small enough (under 100 students) so as not to draw significant attention. At these madrassas, children are denied contact with the outside world and taught sectarian extremism, hatred for non-Muslims, and anti-Western/anti-Pakistan government philosophy. Contact between students and families is forbidden, although the recruiting maulana periodically visits the families with reports full of praise for their sons’ progress. “”Graduates”" from these madrassas are either (1) employed as Deobandi/Ahl-e-Hadith clerics or madrassa teachers or (2) sent on to local indoctrination camps for jihad. Teachers at the madrassa appear to make the decision based on their read of the child’s willingness to engage in violence and acceptance of jihadi culture versus his utility as an effective proponent of Deobandi or Ahl-e-Hadith ideology/recruiter. 6. (S/NF) Children recruited at an older age and “”graduates”" chosen for jihad proceed to more sophisticated indoctrination camps focused on the need for violence and terrorism against the Pakistan government and the West. Locals identified three centers reportedly used for this purpose. The most prominent of these is a large complex that ostensibly has been built at Khitarjee (sp?). Locals placed this site in Bahawalpur District on the Sutlej River north of the village of Ahmedpur East at the border of the districts of Multan, Bahawalpur, and Lodhran. The second complex is a newly built “”madrassa”" on the outskirts of Bahawalpur city headed by a devotee of Jaish-e-Mohammad leader Maulana Masood Azhar identified only as Maulana Al-Hajii (NFI). The third complex is an Ahl-e-Hadith site on the outskirts of Dera Ghazi Khan city about which very limited information was available. Locals asserted that these sites were primarily used for indoctrination and very limited military/terrorist tactic training. They claimed that following several months of indoctrination at these centers youth were generally sent on to more established training camps in the Federally Administered Tribal Areas and then on to jihad either in FATA, NWFP, or as suicide bombers in settled areas. Many worried that these youth would eventually return to try and impose their extremist version of Islam in the southern and western Punjab and/or to carry out operations in these areas. 7. (S/NF) Interlocutors repeatedly chastised the government for its failure to act decisively against indoctrination centers, extremist madrassas, or known prominent leaders such as Jaish-e-Mohammad’s Masood Azhar. 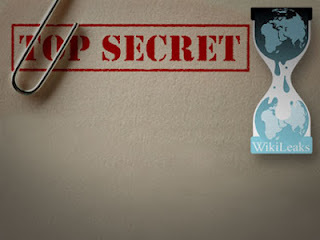 One leading Sufi scholar and a Member of the Provincial Assembly informed Principal Officer that he had personally provided large amounts of information on the location of these centers, madrassas, and personalities to provincial and national leaders, as well as the local police. He was repeatedly told that “”plans”" to deal with the threat were being “”evolved”" but that direct confrontation was considered “”too dangerous.”" The Bahawalpur District Nazim told Principal Officer that he had repeatedly highlighted the growing threat to the provincial and federal governments but had received no support in dealing with it. He blamed politics, stating that unless he was willing to switch parties — he is currently with the Pakistan Muslim League — neither the Pakistan Muslim League – Nawaz provincial nor the Pakistan Peoples Party federal governments would take his requests seriously. The brother of the Federal Minister for Religious Affairs, and a noted Brailvi/Sufi scholar in his own right, Allama Qasmi blamed government intransigence on a culture that rewarded political deals with religious extremists. He stressed that even if political will could be found, the bureaucracy in the Religious Affairs, Education, and Defense Ministries remained dominated by Zia-ul-Haq appointees who favored the Deobandi and Ahl-e-Hadith religious philosophies. This bureaucracy, Qasmi claimed, had repeatedly blocked his brother’s efforts to push policy in a different direction. 8. (S/NF) Interlocutors repeatedly requested USG assistance for the southern and western Punjab, believing that an influx of western funds could counter the influence of Deobandi/Ahl-e-Hadith clerics. Principal Officer was repeatedly reminded that these religious philosophies were alien to the southern and western Punjab — which is the spiritual heartland of South Asia’s Sufi communities. Their increasing prominence was directly attributed to poverty and external funding. Locals believed that socio-economic development programs, particularly in education, agriculture, and employment generation, would have a direct, long-term impact in minimizing receptivity to extremist movements. Similarly, they pressed for immediate relief efforts — particularly food distribution and income support — to address communities’ immediate needs. Several interlocutors also encouraged direct USG support to Brailvi/Sufi religious institutions, arguing that these represented the logical antithesis to Deobandi and Ahl-e-Hadith philosophy and that if adequately funded, they could stem the tide of converts away from their moderate beliefs. 9. (S/NF) A jihadi recruiting network relying on Deobandi and Ahl-e-Hadith religious, charitable, and educational institutions is increasing its work in impoverished districts of southern and western Punjab. Local economic conditions coupled with foreign financing appear to be transforming a traditionally moderate area of the country into a fertile recruiting ground for terrorist organizations. The provincial and federal governments, while fully aware of the problem, appear to fear direct confrontation with these extremist groups. Local governments lack the resources and federal/provincial support to deal with these organizations on their own. The moderate Brailvi/Sufi community is internally divided into followers of competing spiritual leaders and lacks the financial resources to act as an effective counterweight to well-funded and well-organized extremists. 1. (S) Summary: A well-placed Deobandi religious leader told Principal Officer in a meeting on March 18 that extremist group Sipah-e-Sahaba (SSP) was increasing its activities in the central Punjab city of Faisalabad, the province’s second largest, in collaboration with elements of the Tehrik-e-Taliban Pakistan (TTP) and a splinter group from the banned terrorist group Jaish-e-Mohammad (JeM). The cleric reported that SSP had recently launched a pamphlet campaign across the city in which it called for people to take steps to enforce Islamic law including: (1) cease business and social activities at the five daily calls to prayer, (2) remove all sources of “”vulgarity”" such as televisions, cd players, and radios from their homes, (3) seek dispute resolution through local imams rather than the courts, (4) take Friday rather than Sunday as the weekly holiday, and (4) strictly enforce purdah for female family members. The pamphlet states that it comes from SSP with support from the TTP and specifically praises “”the enforcement of Sharia in Swat”" and recommends it as a model for Faisalabad. According the religious scholar, a number of girls’ educational institutions in Faisalabad have received letters stating that if they fail to observe purdah, they could be attacked by suicide bombers. The cleric surmised that SSP activities would increase in Faisalabad on the return of its leader Maulana Ludhianvi from a Libyan-government sponsored trip to that country. End Summary. 2. (S) Leading Faisalabad-based Deobandi scholar and IVLP alumnus Maulana XXXXXXXXXXXX called on the Principal Officer on March 18 to discuss his concerns regarding what he termed as “”growing extremist activity”" in Punjab’s second-largest city Faisalabad. XXXXXXXXXXXX claimed that in the last month he has observed a dramatic increase in propaganda activities from Sipah-e-Sahaba Pakistan (SSP). He believed that this increase coincided with a number of visits to Faisalabad from activists both of the Tehrik-e-Taliban Pakistan (TTP) and a splinter group from the southern Punjab-based Jaish-e-Muhammad (JeM). XXXXXXXXXXXX believed that the activists were involved in recruiting for TTP militant operations in the FATA and NWFP through madrassas in southern Punjab and hoped to replicate that success in Faisalabad. XXXXXXXXXXXX noted that SSP leaders had long-standing ties with JeM, as both were Deobandi organizations that had collaborated in the past in anti-Shia and anti-India activities. 3. (S) XXXXXXXXXXXX shared with Principal Officer an Urdu-language sticker that he claimed he had confiscated from several of his madrassa students in Faisalabad. The sticker, which he stated was also being printed and distributed as a pamphlet, praised the implementation of Sharia law in Swat and exhorted Muslims to pursue the same sort of Sharia law in Faisalabad. It then recounted five steps that every Faisalabad based Muslim should take to begin the process of implementation in the district. The steps were: : (1) cease business and social activities at the five daily calls to prayer, (2) remove all sources of “”vulgarity”" such as televisions, cd players, and radios from their homes, (3) seek dispute resolution through local imams rather than the courts, (4) take Friday rather than Sunday as the weekly holiday, and (4) strictly enforce purdah for female family members. 4. 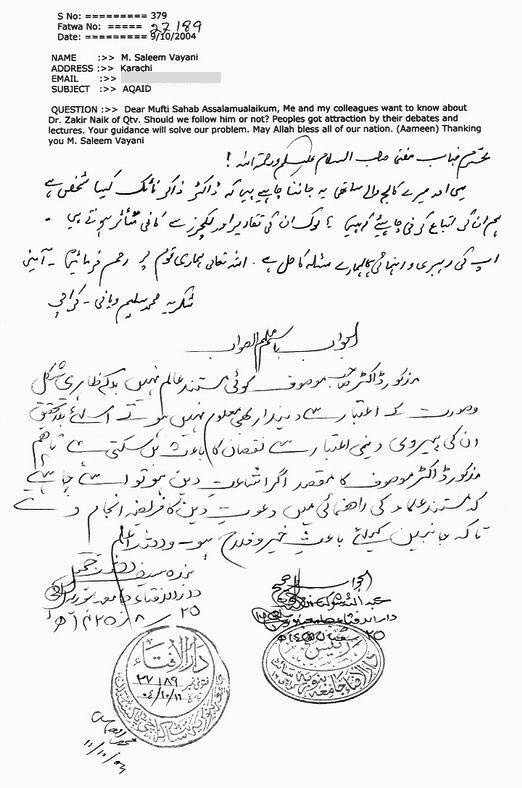 (S) Maulana XXXXXXXXXXXX told Principal Officer that he had initially dismissed the pamphlet campaign, but became increasingly concerned after learning of specific threats received by several girls’ schools (NFI) in Faisalabad. He claimed that these schools had received letters sent from SSP, referencing the situation in Swat, and warning that if these schools did not begin having their students observe complete purdah, the schools could be the target of violence, including suicide bombing. Maulana XXXXXXXXXXXX did not produce a copy of the threat letter. Principal Officer inquired whether any violence had yet occurred in Faisalabad in connection with the SSP campaign. Maulana XXXXXXXXXXXX responded that to his knowledge it had not, but he believed that it could occur in short order if police did not check SSP activities. 5. 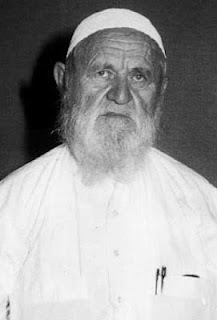 (S) Maulana XXXXXXXXXXXX noted that in addition to its pamphlet campaign, SSP had organized a number of traditional religious conferences in Faisalabad during the Islamic month of Rabwa (currently ongoing). Traditionally such conferences are organized in this month of the Prophet’s birth to discuss the model life that the Prophet lead and to exhort Muslims to follow his example. According to Maulana XXXXXXXXXXXX, this year during the SSP conferences, the organizers have exhorted attendees to follow the Prophet’s example and press for the adoption of complete shariah law in Faisalabad, using Swat as a model. These exhortations specifically call for action against vulgarity and women not observing purdah. In one case, Maulana XXXXXXXXXXXX claimed that he learned that leaders of the recently banned al-Rashid Trust were coming to address a March 8 SSP conference. He stated that he had informed the District Police Officer, who cancelled the event. 6. (S) Maulana XXXXXXXXXXXX shared that he had received reliable information that SSP leader Maulana Ludhianvi was on a fundraising trip to Tripoli sponsored by the Libyan government. XXXXXXXXXXXX claimed that Ludhianvi had made contact with Libyan officials in the guise of working against Iran and Shia agents in Pakistan. (Note: SSP was originally founded as a violent anti-Shia organization and has, in the past, received extensive foreign funding from a variety of Sunni states, including Saudi Arabia. End Note). According to XXXXXXXXXXXX, Ludhianvi was scheduled to return to Pakistan in “”a few days”" and was bringing with him a “”donation”" from the Libyan government valued at nearly 25 million Pakistani rupees (approximately $312,000) that XXXXXXXXXXXX was certain would be used to increase further SSP activities. KARACHI: A US official in a cable sent to the State Department stated that “financial support estimated at nearly 100 million USD annually was making its way to Deobandi and Ahl-i-Hadith clerics in south Punjab from organisations in Saudi Arabia and the United Arab Emirates ostensibly with the direct support of those governments.” The cable sent in November 2008 by Bryan Hunt, the then Principal Officer at the US Consulate in Lahore, was based on information from discussions with local government and non-governmental sources during his trips to the cities of Multan and Bahawalpur. Quoting local interlocutors, Hunt attempts to explain how the “sophisticated jihadi recruitment network” operated in a region dominated by the Barelvi sect, which, according to the cable, made south Punjab “traditionally hostile” to Deobandi and Ahl-i-Hadith schools of thought. Hunt refers to a “network of Deobandi and Ahl-i-Hadith mosques and madrassahs” being strengthened through an influx of “charity” which originally reached organisations “such as Jamaat-ud-Dawa and Al-Khidmat foundation”. Portions of these funds would then be given away to clerics “in order to expand these sects’ presence” in a relatively inhospitable yet “potentially fruitful recruiting ground”. Outlining the process of recruitment for militancy, the cable describes how “families with multiple children” and “severe financial difficulties” were generally being exploited for recruitment purposes. Families first approached by “ostensibly ‘charitable’” organisations would later be introduced to a “local Deobandi or Ahl-i-Hadith maulana” who would offer to educate the children at his madrassah and “find them employment in the service of Islam”. “Martyrdom” was also “often discussed”, with a final cash payment to the parents. “Local sources claim that the current average rate is approximately Rs 500,000 (approximately USD 6,500) per son,” the cable states. Children recruited would be given age-specific indoctrination and would eventually be trained according to the madrassah teachers’ assessment of their inclination “to engage in violence and acceptance of jihadi culture” versus their value as promoters of Deobandi or Ahl-i-Hadith sects or recruiters, the cable states. Recruits “chosen for jihad” would then be taken to “more sophisticated indoctrination camps”. “Locals identified three centres reportedly used for this purpose”. Two of the centres were stated to be in the Bahawalpur district, whereas one was reported as situated “on the outskirts of Dera Ghazi Khan city”. These centres “were primarily used for indoctrination”, after which “youths were generally sent on to more established training camps in the Federally Administered Tribal Areas and then on to jihad either in FATA, NWFP, or as suicide bombers in settled areas”.